DO YOU LIKE TASTY BEEF? DO YOU LIKE TO KNOW WHERE YOUR BEEF COMES FROM? If you are answer yes to all the above questions ,you might like to read on. 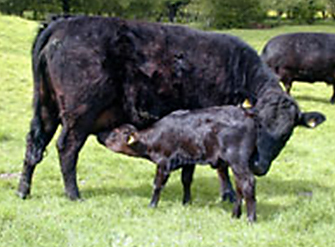 On our small-holding over the hill at the back of Barford, we slowly grow our own grass–only fed beef from our small herd of pedigree Dexters. We are registered with the national Dexter Society and comply with their husbandry standards. Our farm is one of the few farms to be selected to be part of the Higher Level Stewardship Scheme which is a Government supervised European Union initiative to encourage the promotion of endangered species of plants and animals, especially birds and insects. We do not use hormones or intensive feeding to grow our beef – they feed on the grass in summer and the haylage we make from the wild flowers and traditional meadow grasses in winter. This, together with the rare breed that it is, gives the beef a unique flavor as promoted by TV Chef, James Martin and other well known celebrity Chefs. We do not use artificial fertilizers, herbicides or insecticides on our grass fields and wild flower meadows. We cull the beef in late October/November and it is hung for three weeks before being cut into small family joints, each labelled and sorted into boxes weighing a minimum of 30lbs for an eighth of an animal. This amount of beef will fill three freezer shelves of an upright freezer. Each box contains a cross section of the whole animal i.e. mince, pot roast, oven roasts, various steaks from stewing, shin, braising, sirloin, rump and fillet. WOULD YOU LIKE TO LEARN TO PLAY A MUSICAL INSTRUMENT ? Musical tuition is available for FLUTE, SAXOPHONE and CLARINET as well as Theory of Music. Are you interested in finding out about your family history? Let me research it for you. Free initial discussion without obligation. Do you need to keep your information under control, maintain records, send mailings, distribute listings etc?? We can ensure that you have an effective data-base to handle any situation. We can sort out problems or, if you prefer, build a system for you. Would you like a portrait of your dog or a much loved pet who is no longer with you. I can paint you a picture from your photographs, even quite small ones, and frame it so that you have a lovely memento of your special dog. We will be pleased to carry your small ads on this page free. Please us the details. We will not publish addresses, e-mail address or phone number without your express permission. Please indicate with your ad exactly what details you are prepared to publish on the website, and how you want people to contact you. Your attention is drawn to our "Small Ads" policies. By using this section, you are confirming that you agree with the terms stated.